Even the RDC felt the pinch of this year's budget-tightening. Just prior to the presentation of their CIP request to the Council's CIP Budget Committee, some numbers changed. It was good news for the Public Promenade and Cobblestones and mixed news on the Beale Street Landing project. 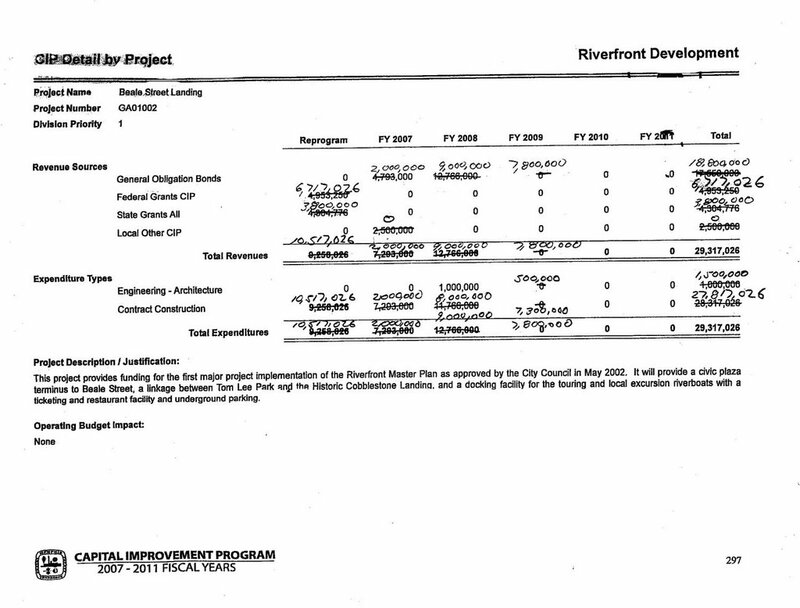 $200,000 in general obligation bonds was cut for Riverfront Planning. The RDC's plan for private development of the Public Promenade falls under Riverfront Planning. $3,800,000 in federal money was added for restoration and improvements to the historic cobblestone wharfage. $ in the CIP for Beale Street Landing increased over the next 3 years, but the general obligation bond request for this year's budget (2007) decreased. Council members were instructed by Committee Chairman Brent Taylor to look only at the amounts requested in the 2007 budget. Councilmembers did just that, and they were pleased to see a reduction in the amount the RDC was asking the City to back with general obligation bonds this year. 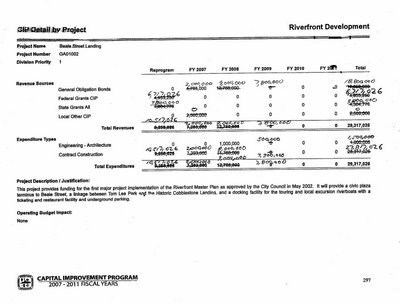 For Beale Street Landing, the amount requested this year from the City for construction was down $2,793,000. But, if you look at the request for general obligation bonds during the next 3 years, the local share of the cost for the landing increased $1,241,000, bringing the total City cost to $18,800,000. Coupled with $10,517,026 in federal and state money, the cost to taxpayers for Beale Street Landing will be $29,317,026. At the CIP Budget Committee meeting there were no questions asked about the need, design, or financial viability of the boat landing. The only vote against approving the RDC CIP request was by Carol Chumney who mentioned environmental concerns about the Beale Street Landing project. Here's the revised request for the Beale Street Landing Project. Click on image to enlarge.